One of the many things I love about running is how strong and powerful it makes me feel, and the fact that that I always feel better after a run than before one. Or nearly always. Today, for the first time running since my Angkor Wat Half Marathon on Dec 1, I neither felt strong nor powerful, and I finished my run 1km short of my 21 km target feeling sore, worried and annoyed. Annoyed with myself because over the past week I had pushed my pace so hard on three 13, 10 and 10km runs that not only are my legs tired even after a rest day, my foot hurts at the site of my PTT (Posterior Tibialis Tendonitis) injury. Annoyed that I may have been a bit foolhardy. 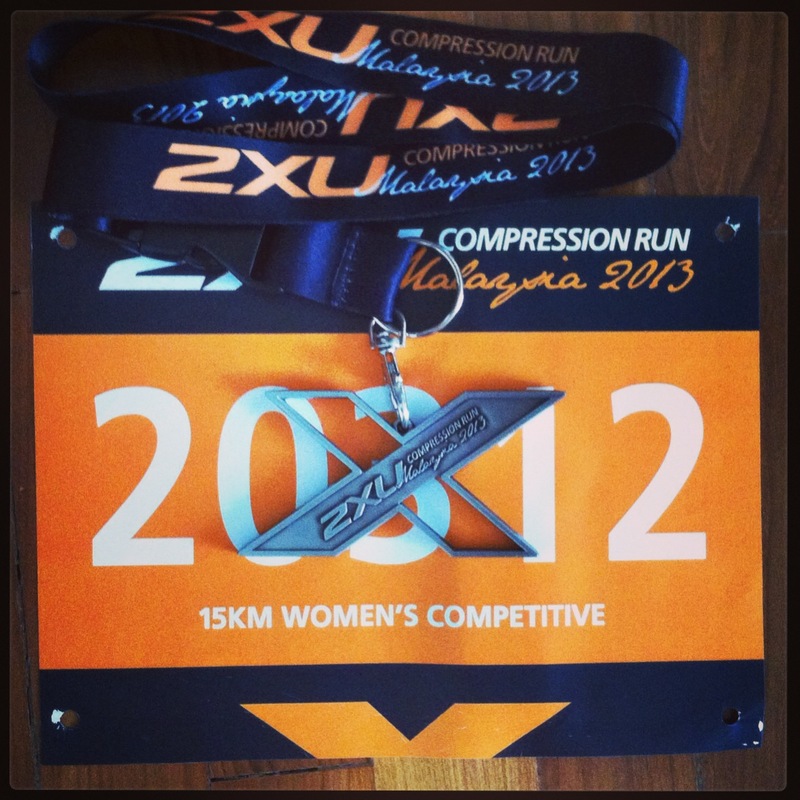 This isn’t good news two weeks before my first Half Marathon of the year, the Malaysia Women Marathon (MWM). My training program has been flexible to say the least though I do try to alternate easy and hard days and run no more than 60km a week. I love to run every day, and rarely think of it in terms of race preparation but rather as a wonderful experience in itself. The trouble is that in the past two weeks I’ve developed a taste for pushing my pace far more than I ever dreamed possible and this need for speed has become addictive. It’s hubris really, and a desire to feel good about myself, that pushes me to run faster – and of course those little crowns on Strava are also very addictive! And to be honest running fast (for me) felt good! But my foot is complaining now so my ego has to take a back seat and I have to rest. I had physio on Friday and though my hamstrings were soft, the muscles in my calves, ankles and shins were very tight and my left Achilles Tendon was screaming (actually it was I who screamed when my PT touched it). The Achilles feels ok today but the right Posterior Tibialis is sore to walk on. 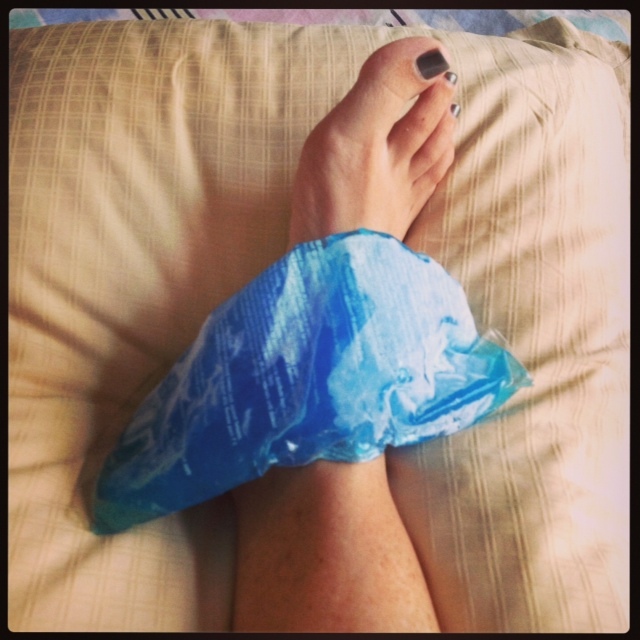 I didn’t write this post to bore you with my injury niggles, nor to entertain foot fetishists, but to serve as a warning against doing too much, too fast. I hated the way I felt running this morning – heavy legged, and ultimately sore footed – and it means I can’t run tomorrow unless my foot feels significantly better in the morning and even then it can only be a short, slow recovery run. I know, I know, I probably shouldn’t run, even if it does feel better. Exactly four weeks ago, I ran a personal best 21km which inspired hope of repeating the effort at MWM. After today, I am concerned that I may not be able to run the race at all. Another of the great things about running is that you learn a lot of things – humility, resilience, respect for your body’s power and limitations, and how sometimes if you get carried away, as I have done (a few times! ), that a price must be paid. Let’s hope it doesn’t come to that. So, runners, remember rest days are very, very important so find some low-impact activity to do on these days if you can’t bear not doing any exercise at all. Alternate easy and hard workouts. Hard workouts would be tempo runs, long runs, interval training, hills etc. Strength and stability training of ankles, calves, quads, and glutes is a no-brainer (yeah, I’ve been lax on that one too). The core and upper body should not be neglected either. Stretching out those tight leg muscles after a run is essential to aid recovery and prepare your body for your next run. Not doing so will lead to the formation of adhesions and scar tissue which will ultimately lead to pain. I’ve got into the habit of stretching my calves while I’m waiting for the coffee machine, microwave and brushing my teeth. I assume I’d be even worse off today if I hadn’t. Listen to your body, preferably before it starts shouting abuse at you as mine is doing now. No matter what your race goals are, if any, ultimate responsibility for your health lies with self. Running isn’t bad for you (it’s the best thing evva! ), running irresponsibly, as I have done recently, can be. Do as I say, and not as I have done. 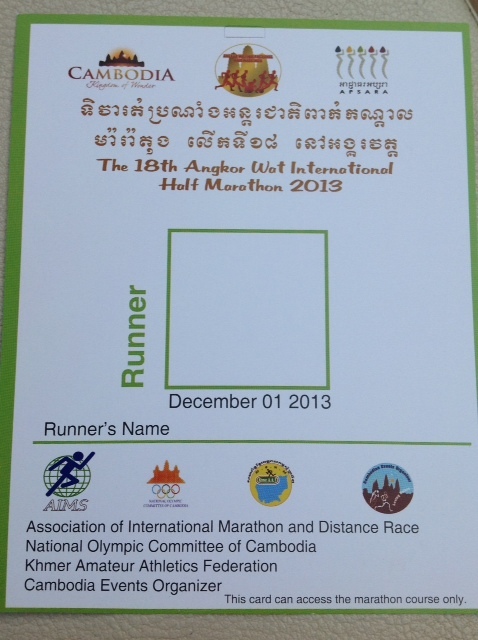 Angkor Wat Half Marathon was, for me, dominated by toilets rather than the temples. And judging by the queues at the portaloos pre-race and the number of people scurrying behind trees and rocks during the run – I’ve never seen anything like it! – I wan’t the only runner thus challenged. Still, I’ll try and put my loo issues behind me – ahem – and focus on other aspects of the race. Firstly, Siem Reap is a lovely town of low-rise buildings, teaming with stalls, shops and restaurants. Angkor Wat Temple is about 15 minutes drive out of town. The race was SUPPOSED to start at 6.30AM on Sunday so we left our hotel at 5.30AM and arrived in plenty of time to queue up for the loos. My friend and I joked that it was better to wait in line for the loo and to time a last wee just before the gun went off than to go in the bushes and end up hopping from one foot to the other with nerves at the start line. Mistake! 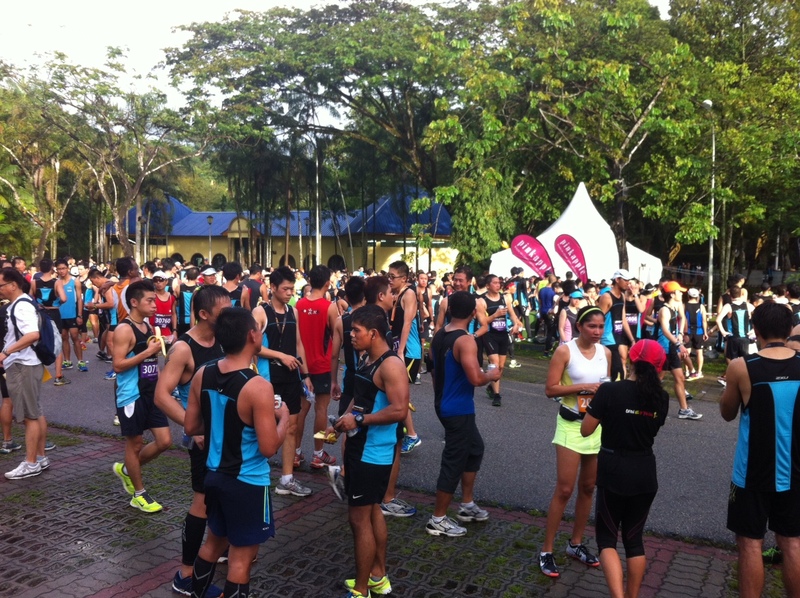 As we ran from the portaloos in the direction of the start, we realized that the race had already started – without us! And it was only 6.24! 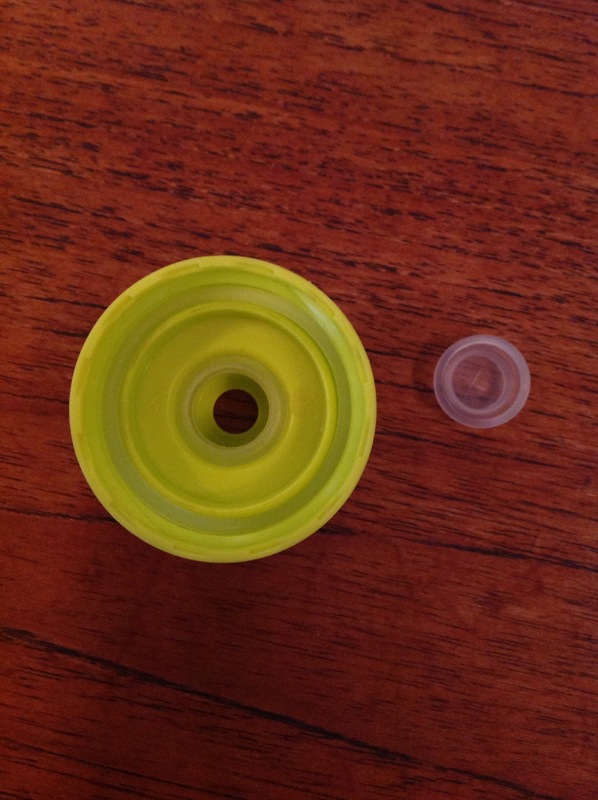 My broken Nathan bottle race cap. So I was three minutes into the race crossing the start line, which makes my ranking on the results look bad, but heh I was never going to be in the Top 20 anyway so there’s no use in being upset. Actually upsetting, was the fact that the valve on my Nathan bottle collapsed at the start, sending my Accelerade drink all over my shorts and leaving me with no fuel for 21 km. Water stations provided 350 ml bottles of water every 2.5 km and I ended up carrying one for most of the race; this did nothing for my posture but made me feel more secure about staying hydrated. The disadvantage of starting so far back was the need to overtake slower people who had started at the front. Weaving in and out, and avoiding slamming into the back of runners who stopped to take photos, dominated the first 5 km, which I took easy, breezy and dare I say I would have enjoyed if it hadn’t been for the constant need to swerve around people. At about 8km, I looked longingly at a gel a girl was taking though I had none with me as in the past they’ve made me feel nauseous. Another girl had a bag of Haribo gummy bears but she didn’t offer me any;( Of all the rear ends I saw on Sunday, one stuck out from the crowd. ‘How’s my Running? Call 1-800-EAT-DUST!’ was printed on a girl’s shorts. Love it! Somehow, after running around a slower lady, I got dizzy, and felt my stomach lurch. I took the next few kilometeres at a pretty good pace, keeping an eye out for a toilet, debating whether it was worth the loss of time or not. At around 10 km, I spied a sign for toilets and bolted out of the race and into the loos. I never thought I’d sabotage a race thus, but I did. 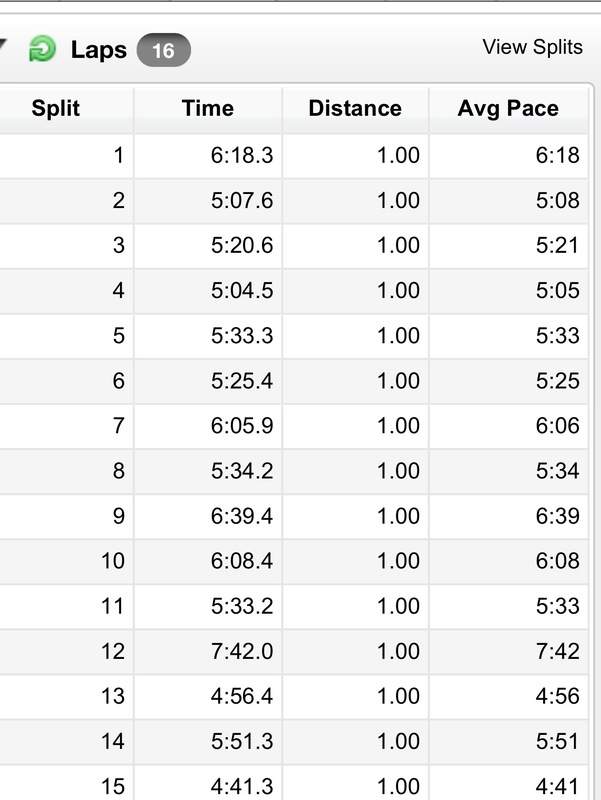 Somehow my pace never recovered after this. Having passed so many runners before the pit stop, I couldn’t muster the will to try and pass them again. In fact I don’t really remember much of the last 10 km; probably due to a combination of lack of endurance training (I had a stitch for 9 km), lack of electrolytes (may also have caused the stitch), and the fact that I’d been sick for the 10 days prior to the race. I’m afraid, I wasn’t running with joy, more a sense of a chore that needed to be completed. I didn’t at any point run fast enough to get out of breath – during the first half I was afraid to in case I ran out of steam, during the second half I simply couldn’t because of the stitch. Strangely, I crossed the Finish line feeling cold, my skin covered in goosebumps. I was delighted to meet a friend who gave me water as there were no refreshments distributed on the finish line. The medals were hard to find too; eventually, after asking many people, I found some children handing out medals to anyone who asked, in the middle of the finish line melee. My husband, who ran the 10km, got a medal identical to mine, stating Half Marathon. I’ve read complaints on Facebook that there were no medals left for Half Marathon runners who came in around the 2:30 mark which seems very unfair! Unfortunately we couldn’t hang around after the race for more than a few moments as we had a flight to catch back to Kuala Lumpur. My time was 1:56, which was a PB, but the fact that it could have been nearer 1:54 without the pitstop is hard to let go. Still, one MUST be positive. My foot, which I had taped, didn’t hurt at all during or even after the 21 km which, if I wasn’t such an ungrateful cow, should have been my opening line on this post. I’d love to return to do the Angkor Wat Half Marathon in 2014 but as we’re moving to Perth, and there are no direct flights from Perth to Siem Reap, I’ll probably not have the opportunity. If we were staying in Malaysia, I’d definitely return (wearing a nappy – kidding!). I’m determined to master this 21 km lark. By this I don’t necessarily mean improve my timing – though this of course would be nice – but to cross the Finish line feeling a sense of achievement. Looking back I can see that the races I’ve enjoyed most, or that have given me a sense of accomplishment, have all (three) been 15 -16km. I haven’t registered for another Half until March, so I’ve plenty of time to work on my stamina and endurance to see if I can ‘master’ the 21 km distance. In the meantime, I’ve ordered new race caps for my Nathan bottles and I will continue with physio for my PTT. And then there will be race toilet training which I have now added to my New Year’s resolution list for 2014! Rain and hills were the order of the day – though I’m not sure 6 AM is technically day as it’s before sunrise here! As it was my first race since early June, and my longest run since late August due to my PTT problem, I kept my expectations low for yesterday’s 2XU Compression 15km Race. 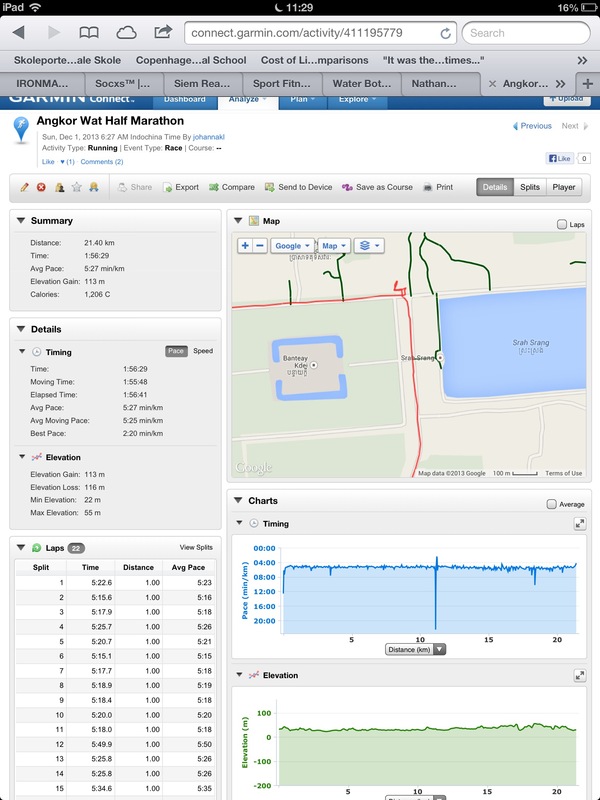 There was no question of aiming for a personal best; yesterday was about running, simply because I was able. Find a parking spot not too far from the Start line. Make one last dash to the portaloo before race start. Finish (perhaps not joyously, but in one piece). Well, tick, tick, tick, tick and tick! The race started 10 minutes late due to rain. Being Irish the rain didn’t bother me, and anyway after a few kilometers running in the Tropics, even at night, your clothes are sodden so the rain was a good thing – it kept the temperature down to a nice, chilly 25 Degrees Celsius. Yes, I know that’s a heatwave in Ireland but I’ve made some adjustments to my thermostat after 8 years in South East Asia. Padang Merbok: a popular race venue in Kuala Lumpur. Pace all over the place! If there is one word that will forever be synonymous with yesterday’s race it is HILLS! I wish I had a photo to show non-KL people what I mean but suffice it to say that one of the two KILLER hills is referred to as ‘La Mur’ – according to my cyclist husband. That’s The Wall in case you’ve forgotten your French. Have a look at the elevation profile if you think I’m exaggerating. The second steep incline was equally challenging and very, very long. I walked up most of both these; though I like a nice hill or two, and ran well on the more moderate inclines yesterday, I wasn’t going to tear my Achilles Tendon or burn myself out on these babies. My goal was to finish (joyously), remember? I ran pretty fast downhill. In fact, my pace was all over the place! 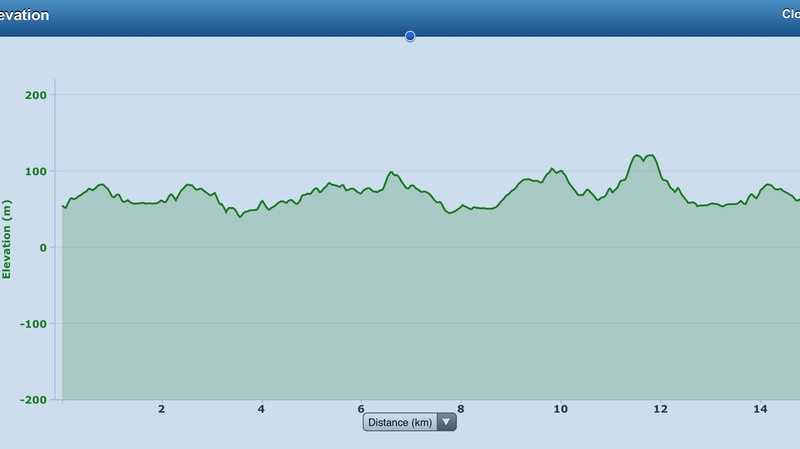 Elevation profile for the 2XU Compression 15km Race. It looks like the Himalayas, no? I paid no attention to my watch the whole way around, instead I tried to focus on my rhythm of my stride, the view – spectacular sunrise with a view of the Petronas Towers – and the sense of collective effort that surrounded me. The guy who belched very loudly on the first long incline also served as a brief distraction. Whenever my mind started to give me a bit of grief, as it always tends to, especially near the end of a race irrespective of whether it’s a 10km or a 21 km, I repeated the mantra ‘I Love Running’ to match my cadence. It’s true and it worked. I love running and my recent forced absence, has given me a new appreciation for just how deep that passion is. 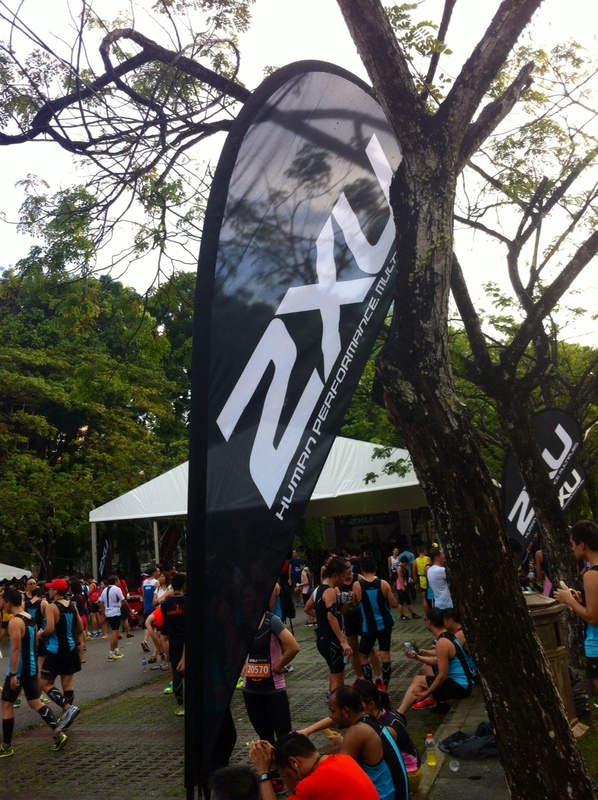 I doubt I’ll be in Malaysia next year, but if I was, I’d definitely register for the 2XU Compression 15km run (and do some hill-training in preparation). Plenty of portaloos, well-organised and frequent water stops, excellent route markers, enthusiastic volunteers giving directions and support, nice wide roads throughout the route and some amazing views of KL. The medal is pretty cool too. Killer hills, rain, 4 AM breakfast, belching runners? Bring it on! p.s. For those interested in my PTT (right foot) recovery, my foot felt good throughout the race though the Achilles Tendon on the left leg was not happy. As soon as I finished, I felt pain in my right arch and left Achilles, and iced them both before heading home. I’ve been stretching and rolling the arch with a tennis ball in the 24 hours since, as well as icing and elevating as much as possible. This morning, I did a slow recovery 5km. The arch still ached but there wasn’t a murmur from the Achilles so hopefully it has forgiven me yesterday’s folly exertion.